If You're Looking For Live Out Loud's Lead Magnets & Low-Dollar Items ... You're In The Right Place! If You Have Questions Regarding How These Products Are Delivered Or If Some Information Is Incomplete Below, Please Contact The LOL Marketing Team. You could go out and read EVERY book ever written on Raising Capital or Business Funding, spend HOURS interviewing industry insiders, and actually go out in the field and DO this stuff like Kevin Harrington has. Listen this simple 62-minute audio program that condenses down everything Kevin has learned about funding businesses and what investors like me are looking for. Use this audio program outlined into 10 steps to create your perfect pitch – as taught by the pitch master himself, Kevin Harrington. Any pertinent FAQs that we can provide to our Customers: This program is delivered entirely online. Crowdfund The Entrepreneurial Project That Matters To You! 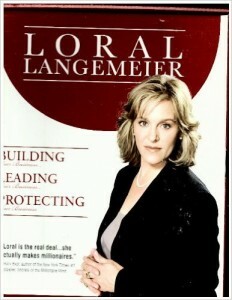 Loral Langemeier – International Wealth Expert & 5-Time New York Times Bestselling Author – and Kevin Harrington – Chairman of As Seen On TV, Inc. & Crowdfunding Expert – have created this unique platform to enable entrepreneurs to crowdfund their start ups, build their businesses, gain access to crowd funding resources and learn how to make millions. This Shark Funding Platform is a once-in-a-lifetime opportunity for you, created by two of the top money-makers in the world where you’ll get everything you need to develop the life of your dreams. Shark Funding is a crowdfunding website geared specifically toward you – the entrepreneur who needs to connect with investors to take your business to the next level. We are a community of entrepreneurs backed by two of the most successful and lucrative entrepreneurs this world has ever seen – Loral Langemeier (the “Millionaire Maker”) & Kevin Harrington (the godfather of infomercials). In their illustrious careers, Kevin – chairman of As Seen On TV, Inc. – has launched more than 500 products with cumulative sales of more than $4 billion, while Loral – international wealth expert and 5-time New York Times Bestselling author – has helped create more than 2,100 millionaires. Their unmatched combination of cash-creating expertise, out-of-this-world Rolodex, and generation-changing strategies is just what you need to add thousands of dollars into your bank account daily and live how you’ve dreamed. Learn How To Leave Your Job In Just 120 Days! What most people fail to realize is that debt elimination is only a small piece of your overall financial picture. This doesn’t mean that you should put your head in the sand and do nothing at all. Thankfully, as with most things, there is a solution. Even better, the solution is much easier than you think. Hi, I’m Loral Langemeier, and people have called me “The Millionaire Maker” because I’ve been making millionaires for 10 years through the products and programs of Live Out Loud. I’ve done it by educating eager, committed people just like you how to make money. I don’t care if you’re just starting on this journey or you’re a long-term successful business owner. You have the ability to be a millionaire…when you know the system, when you know the secrets that millionaires use. Now it’s your turn to put more money in your life. The key to wealth isn’t to stop drinking the daily latte or to live an austere life. The key is to make more money. It doesn’t matter if you work for someone else or yourself. Each of you has a gift and talent that people want and will pay money to receive. 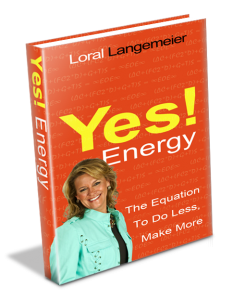 In Loral’s best-selling book, “Yes Energy!,” she introduces a new equation that focuses on eight different areas that create energy, momentum, and extreme optimism. In the Complete Yes Energy Roadmap, Loral will help you break down each one of these areas and exactly how you can put together a daily plan to live the biggest life possible. When you’re living a lifestyle filled with extreme optimism, your results will quickly begin to exceed your goals. This roadmap will help get you there! Mindset-Shifting Interview: Learn What It Really Takes To Make Money! 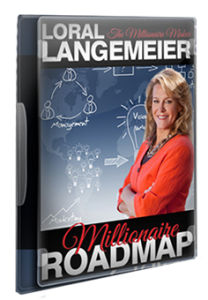 In this no-holds-barred 24-minute interview, multi-millionaire and global money expert Loral Langemeier shows you exactly what it takes for you to take charge of your money & wealth-building so that you (and your business) can make new money – FAST! Time to start on the path to becoming a Millionaire! Let’s Go! I want to give you a FREE GIFT that will help you get the edge you need to experience amazing growth. Soak in the knowledge you need to take your business to the next level from the comfort of your home or office. It’s completely digital and you don’t have to wait for it. This is 70-minutes of video you can use TODAY to make more money, get more customers, and develop a winning mindset that will help you overtake your competition. 1) Shift your focus and develop a Millionaire Mindset, so you can make more money every day. 2) Create and distribute additive revenue. 3) Say Yes and Figure Out How!” to increase the quality and quantity of opportunities that come your way. 4) Create new cash and opportunities immediately using your existing skills and training. 5) Stay motivated regardless of economy or circumstance. 6) Form a marketing funnel to create consistent customers and increase your per customer revenue. You’ve gotten this far, now it’s time to play bigger, better, and make more money than ever. 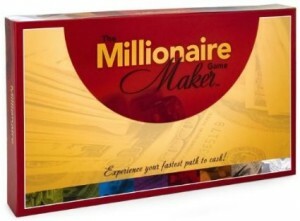 The Millionaire Maker Game, a new educational board game designed to expand the financial minds of Americans everywhere when it comes building a life of financial freedom. The Millionaire Maker Game was created by DreamLife Games, LLC and Loral Langemeier, three-time national best-selling author. The Millionaire Maker Game delivers an interactive experience where players are cast into the life of an entrepreneur where big deals are made daily. Players can lose everything or live the life of luxury based on the choices they make. “Who doesn’t want to be a millionaire? Now anyone can be an instant one right in the comfort of their own home, using the same techniques in the game that I have used in business to help hundreds of my clients become millionaires in as little as three to five years. It takes teamwork to live a millionaire lifestyle and by playing as a group, participants learn to build their wealth together,” said Langemeier. In this entrepreneurial game of creating Wealth Cycles like the wealthy do, players have the option to kiss their W-2 job goodbye and live a life of extreme wealth by building assets and owning income-generating businesses. Like real life for an entrepreneur, the game is filled with opportunities and challenges. Participants can build diversified financial portfolios consisting of real estate assets, such as a six-unit apartment building, or even purchase a share of an oil well. Players can also get sued by a disgruntled employee or possibly have to give up some of their assets that aren’t structured properly. By rolling dice, choosing cards and participating in the foundational building blocks that create a Wealth Cycle, players have 60 minutes to the make the best, strategic business decisions they can to end up with highest net worth. The player with the highest net worth wins! 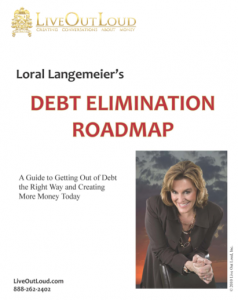 Powerful online CD set with Loral Langemeier and her mentor, Bob Proctor. It walks you through the gifts, talents, skills, and abilities that all of us take for granted. Recognizing these innate qualities we possess is absolutely vital to gaining confidence in yourself to move forward with your life, realize your dreams, and Live Out Loud. A 30-minute training audio where Loral and Bob walk you step by step through a powerful process we call the “Capacity Wheel”. You’ll learn how to define your current capacity and ways to infinitely expand it in 5 key areas of your life, starting with your finances. You’ll receive instant access through our private members areas plus an audio version that you can easily download to your computer or mobile device to listen on-the-go and anytime. A PDF action guide that you can download and print out. Use this to take notes and follow along during the training audio. This will become an essential tool to help you conceive, record, and say YES to infinite possibilities until they are expressed in material results. 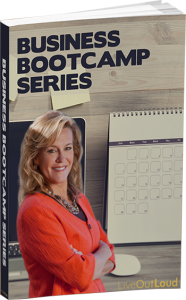 Discover the 7-step process that will accelerate your business and position it as an asset in your wealth building plan. In this interactive online program, you learn to take massive action to get your business, the Cash Machine of your Wealth Cycle, booming. Building, Leading & Protecting Your Business is a 4-part audio series that includes an action & integration guidebook. 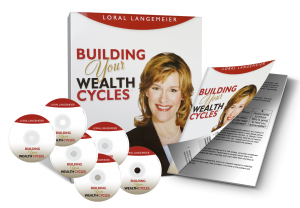 Loral walks you through the action steps to build a wealth plan with all of the necessary pieces. Throughout the CDs and workbook, you’ll put together your own money rules, understand the role of due diligence, discover how to evaluate deals and opportunities, as well as structure yourself to keep more of the money that you make both in your business and investments. • Step 1 – Improve Your Conditioning: If you want to tap into a Wealth Technology that makes you more financially intelligent and literate, you’ll be glad to know that it is well within your reach. • Step 2 – Identify Your Financial Baseline: Your financial baseline is a reflection of your past financial awareness. Whatever conditioning has brought you to this very moment in your life – financially – has created your financial results. • Step 3 – Clarify Your Financial Freedom Day: The most informed decisions can only occur when you understand the gap; otherwise you may be making emotional short term decisions. The gap exists between where you are now (your financial baseline) and where you want to go (your financial freedom day). • Step 4 – Manage Your Lifestyle Cycle: Using income to create assets is called a “wealth cycle,” which is defined in the next lesson. • Step 5 – Build A Wealth Cycle Foundation: Begin putting together what you’ve learned to build your Wealth Cycle with a strong foundation. • Step 6 – Learn The Steps To Wealth Acceleration: Revealing the “secrets to success” that the truly wealthy use to stay on top. This section is a step-by-step tactical actionable plan to Building your Wealth Cycles and accelerate them. • Never be held back again because you don’t know HOW!